Where is this stupendous architecture when you need it? Sorry folks, they do not build them like this any more. These imposing structures with all the look and atmosphere of a superhero's (or a supervillain's) headquarters now exist in a time warp, dwarfed by lifeless and faceless obelisks of financial and corporate might, only infrequently noticed by the busy and harried populace below. I am talking about the 1920s and 1930s imperial style in architecture, loosely classified as Art Deco (although Art Deco is a much wider definition). 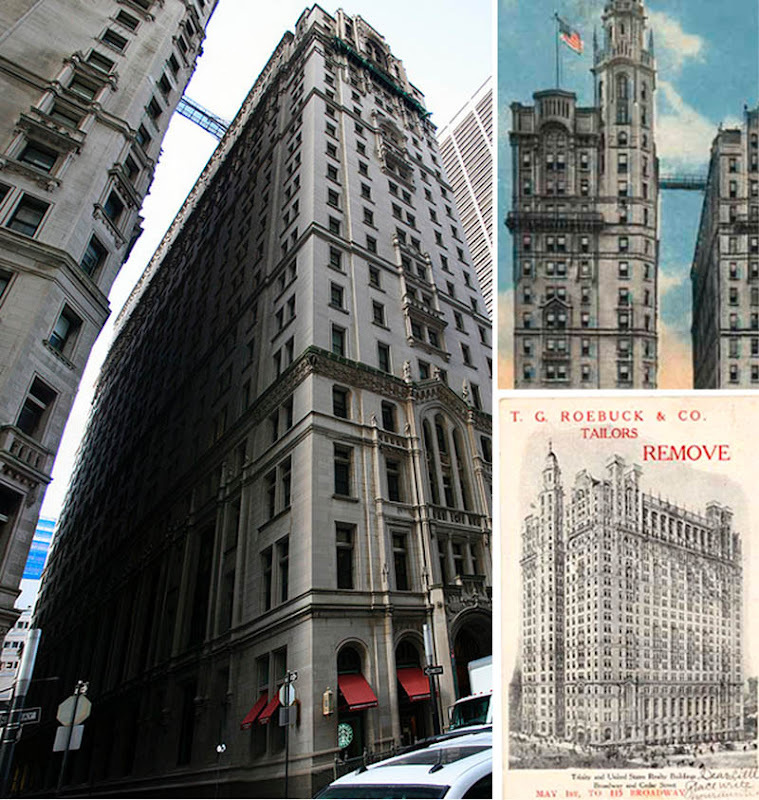 The gothic and Gotham-styled edifices that were built in Manhattan and Chicago in the heady days before and during Depression are incredibly attractive to our eye, asking to be featured on DRB as often as possible. Well, here is the first installment, with many more (we hope) to come. 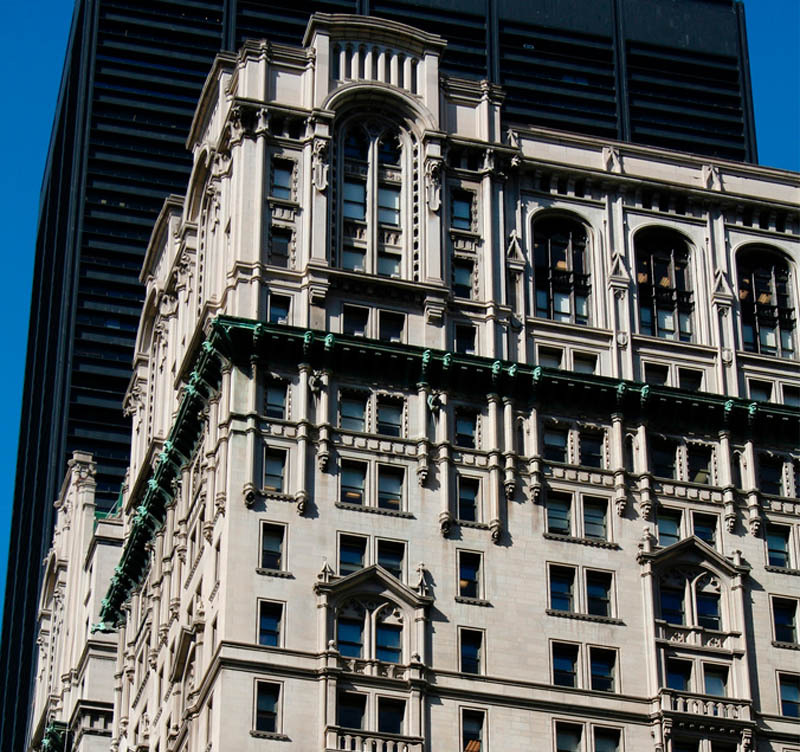 Location: 111 and 115 Broadway at Thames Street. 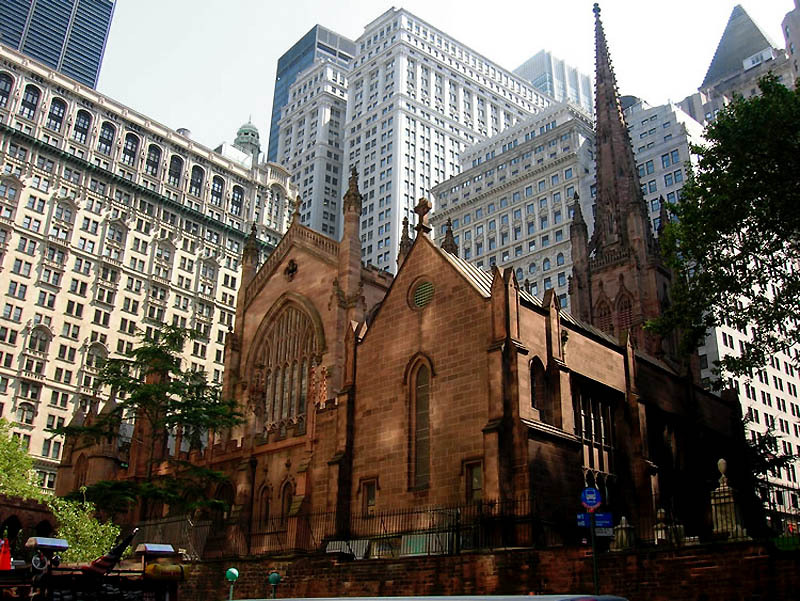 Built to complement Trinity Church (the true anchor of Wall Street), with just as much style and elaborate gothic feel, this fantastic building has to be seen to be believed. First, it sports some truly beautiful ornamental sculptures (including brass dragons!) and second - well, just wait till you see it in the light of a full Moon... it will seem as imposing as Harry Potter's castle, if you squint just right and forget about dozens of bulkier buildings around it). 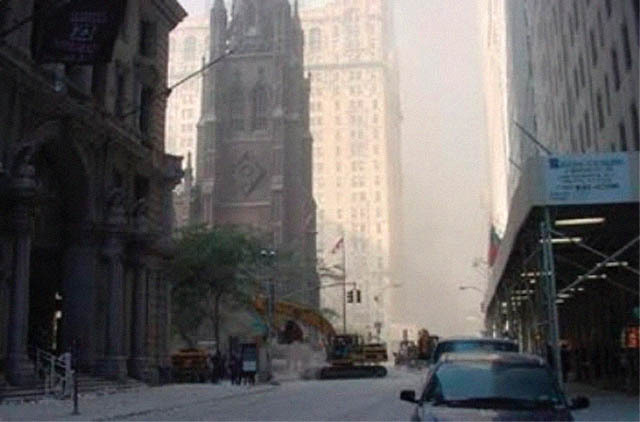 "During the September 11, 2001 attacks, as the 1st Tower collapsed, people took refuge from the massive debris cloud inside the church. Falling wreckage from the collapsing tower knocked over a giant sycamore tree that had stood for nearly a century in the churchyard of St. Paul's Chapel, which is part of Trinity Church's parish and is located several blocks north of Trinity Church. Sculptor Steve Tobin used its roots as the base for a bronze sculpture that stands next to the church today." 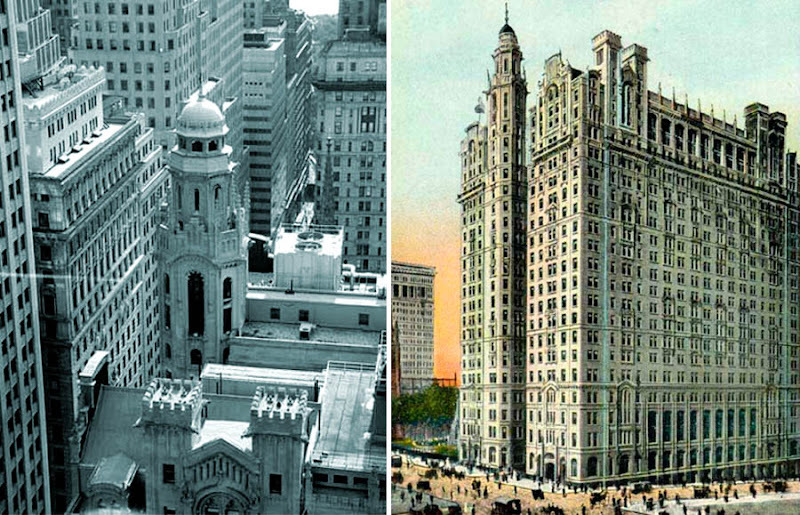 "The Trinity is headed, at the Broadway/Thames angle, by a cupola, while the U.S. Realty is topped by crenellated frontons." 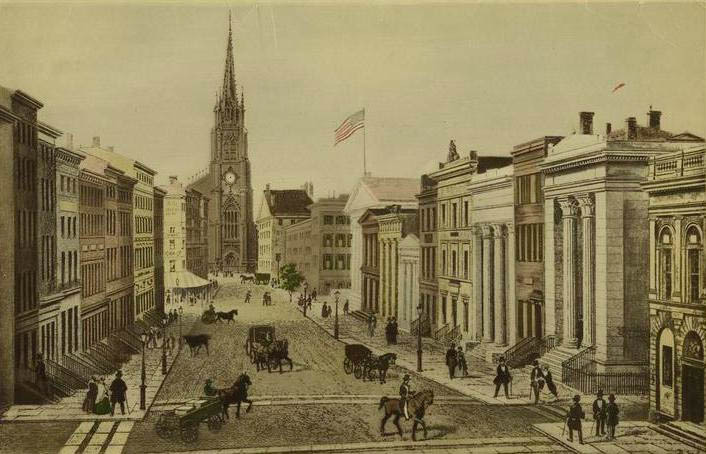 It is also worth mention that Trinity Building was constructed on the very place of the first office building in New York. 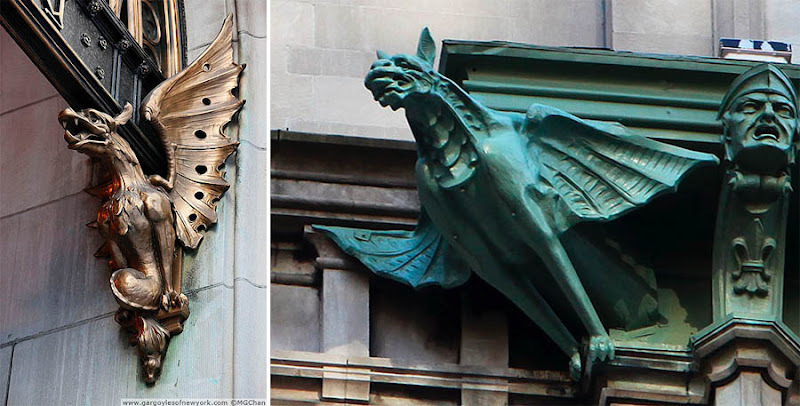 More interesting gargoyles and also a mystery of a "masked lady" sculpted face on Trinity Building's facade can be seen on Scouting New York: highly recommended site for all interested in discovering hidden NY gems. 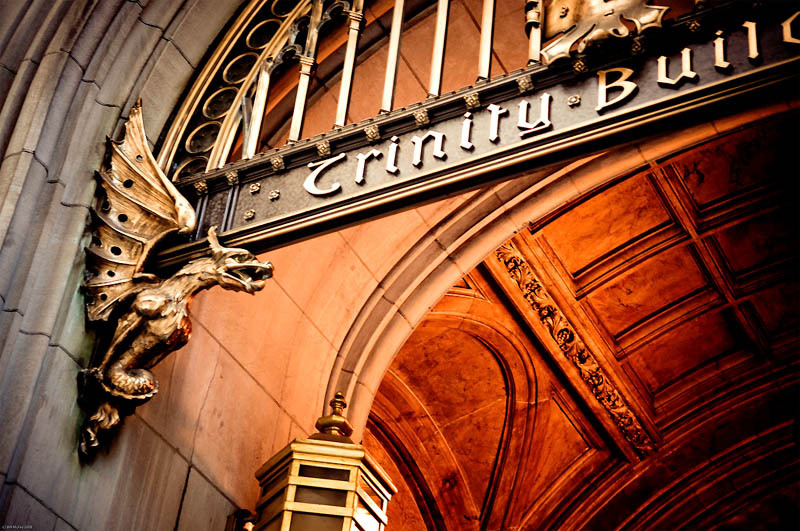 Trinity Building lives up to its gothic character. It even has a twin tower - the humbly named US Realty Building. 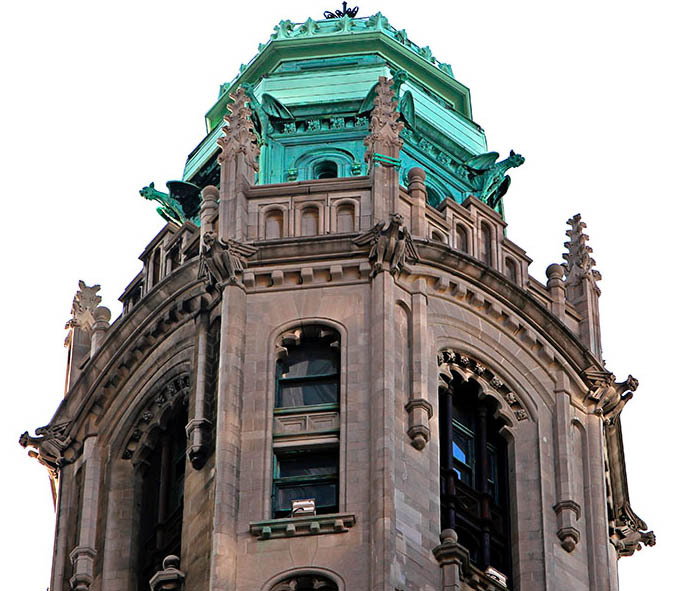 But do not be deceived by its ho-hum name: this skyscraper is just as rich in ornaments and Art Deco detail as the Trinity Building. This is great: all the more real estate to explore for those who appreciate art deco and imperial architecture! These building stand so close to each other that they are even connected by a bridge: this steel footbridge was added in 1912. Can you imagine trying to look out of the office windows in the towers facing each other? You would stare right into the other guy's sandwich. 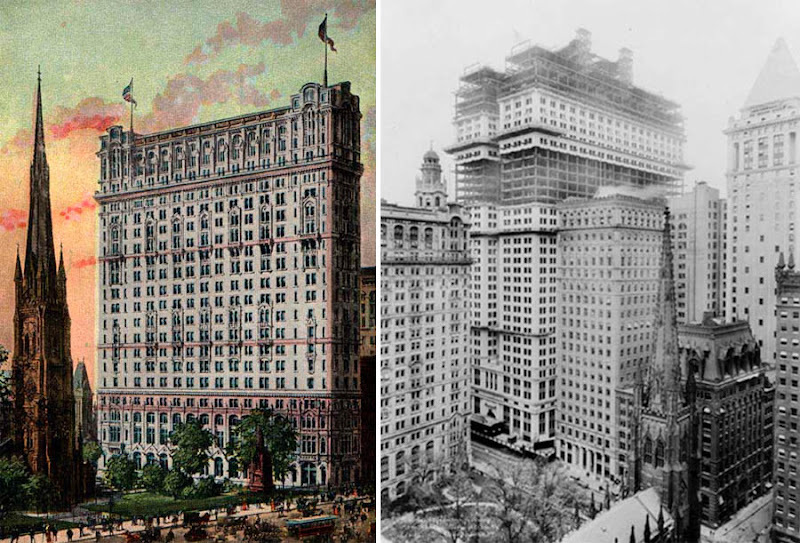 Not to mention that it will be permanently dark (these towers were built before the famous "stepped-back" skyscraper shapes became the norm, and so this is perhaps one of the few true sunless canyons left in gothic New York). Incredible building. 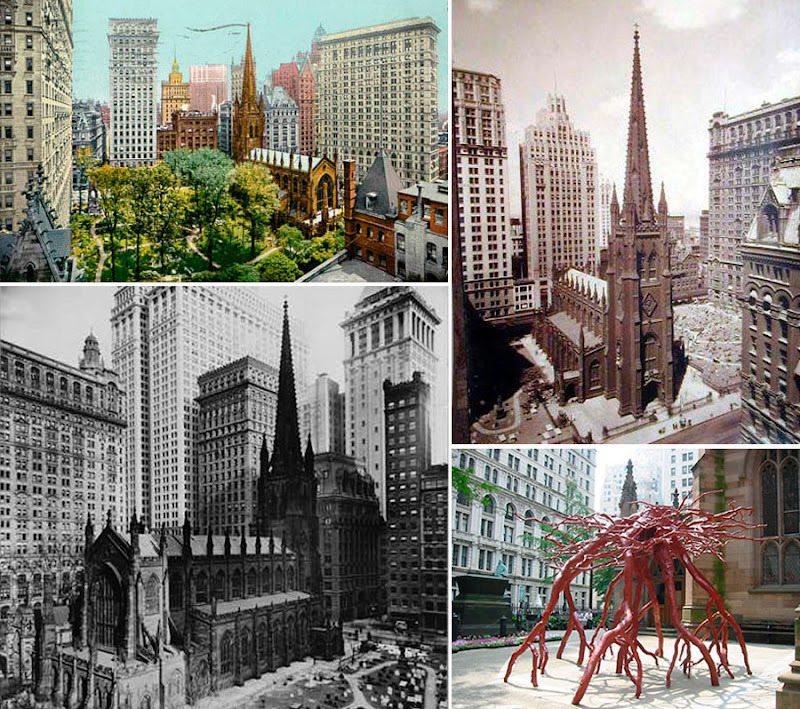 Together with the Trinity Church, this pair of architectural masterpieces presents the true testimony to the spirit of sophisticated and dynamic place that is New York - with the additional blessing of the Holy Trinity right in the New York's busiest heart. Nice article, and I hate to do this to someone who appreciates architecture, but this building is not Art-Deco. Not even close. It is gothic. 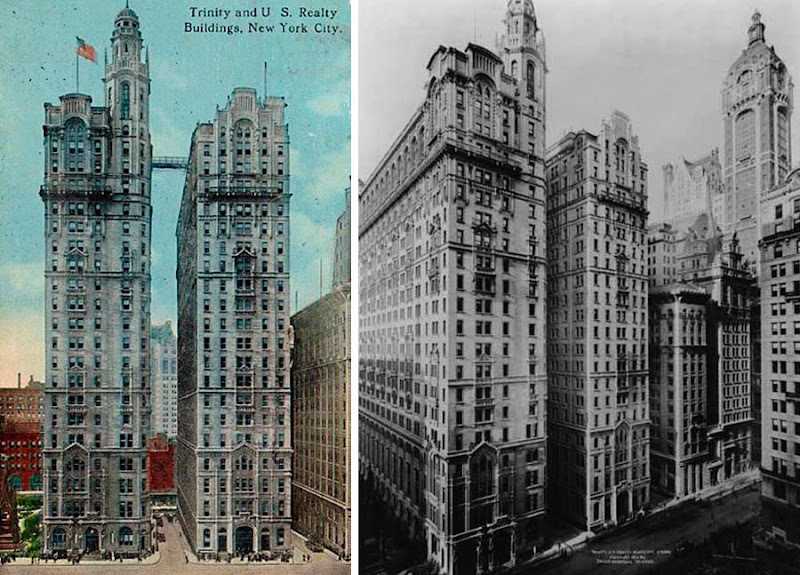 Art-Deco began in Paris in the 1920s, the Trinity Building was built in NYC in 1904-05. Just sayin. You are absolutely right. We did have to fit it under "Art Deco" series, but only reluctantly. I am pretty sure, though, that gothic style has had significant influence on development of Art Deco - including this skyscraper as something to measure up to. are those gargoyles on trinity building or are they actually grotesques? Your description of modern architecture as "lifeless and faceless obelisks of financial and corporate might" is spot-on target. They are indeed grotesques, as they don't spout water. Still, fab article. Who are all the carved faces over the main entrance? Let's have more! 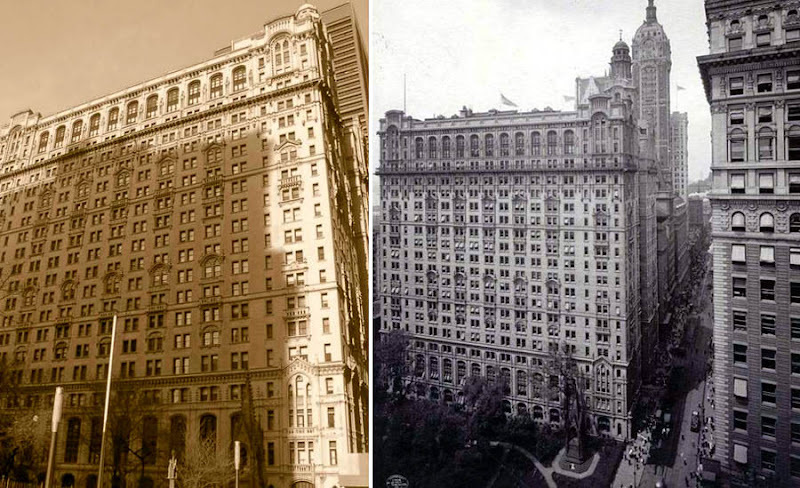 I once dedicated a whole day to doing nothing but walking about Manhattan seeking out all the lovely old art deco/gothic/whatever-you-want-to-call-'em buildings that still exist, tucked away beneath the modern layer of mammoth skyscrapers. I found the easiest way to locate them was to go up about 30 floors in a building and find a large glass window to look down out of... made 'em easy to spot and mark on a map for closer inspection. 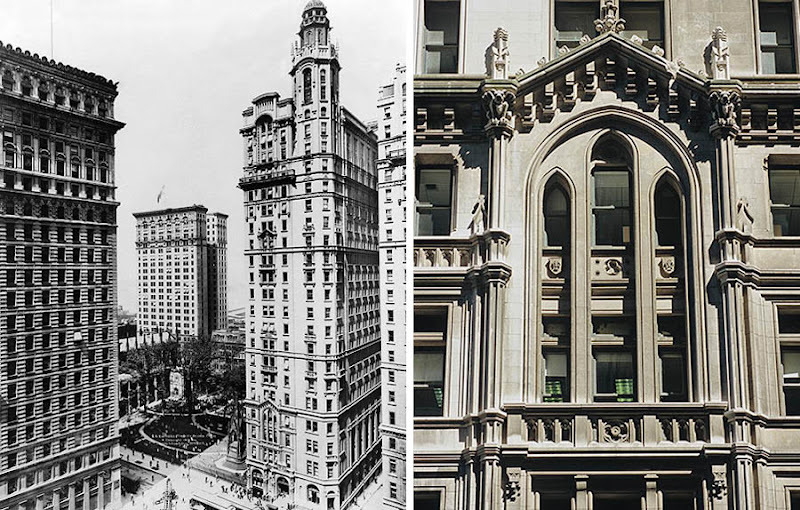 New York City actually has a gorgeous architectural heritage still in existence, it's just hard to see those grand old trees for the forest of the newer buildings. I found the easiest way to locate them was to go up about 30 floors in a building and find a large glass window to look down out of... made 'em easy to spot and mark on a map for closer inspection. These two buildings aren't even close to being art-deco. They are neo-gothic. 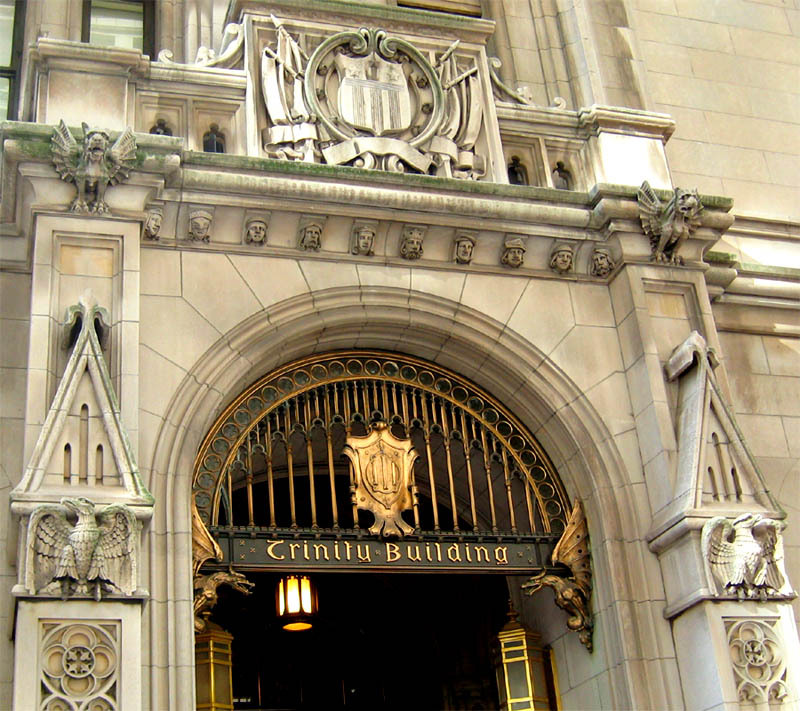 Art deco can be neogothic like the Tribune Building in Chicago. These lean more on the beaux arts side though. 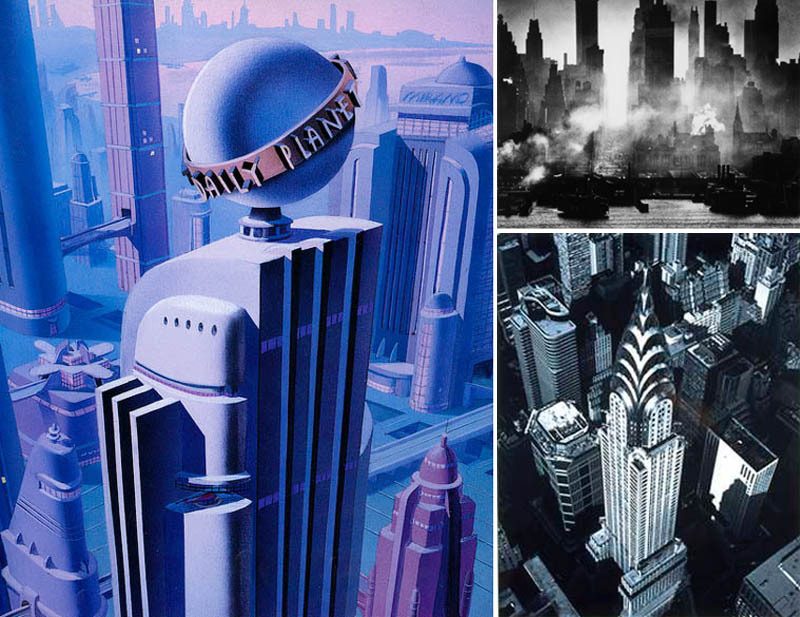 You say you "had" to call it Art Deco? Why? Who is in control at your site that they make you post something wrong? My great great grandfather died during the construction of the The Trinity Building in 1906.